If the Spring weather is still cold at your house, this Vegetarian Minestrone Soup sounds perfect for an easy dinner, and you can make it in the Instant Pot, in the slow cooker, or on the stove! Click here to see The Top 10 Slow Cooker Soups, plus Honorable Mentions! If you wake up to one of those cold and dreary spring days with rain or snow, this Vegetarian Minestrone Soup from Skinnytaste is tasty for a tummy-warming dinner that’s not too heavy! And you can make this tasty soup in the Instant Pot, in the slow cooker, or on the stove. And if you prefer a soup with meat, just add some to this versatile recipe. Personally, I think a light meatless soup like this Vegetarian Minestrone Soup would make a great choice for a family-friendly dinner this time of year. There’s lots of flavor from vegetables and herbs, and Gina uses the trick of cooking the soup with a hunk of Parmesan rind for extra flavor. Give this tasty winter-into-spring soup a try and have a tasty dinner that’s easy to make! 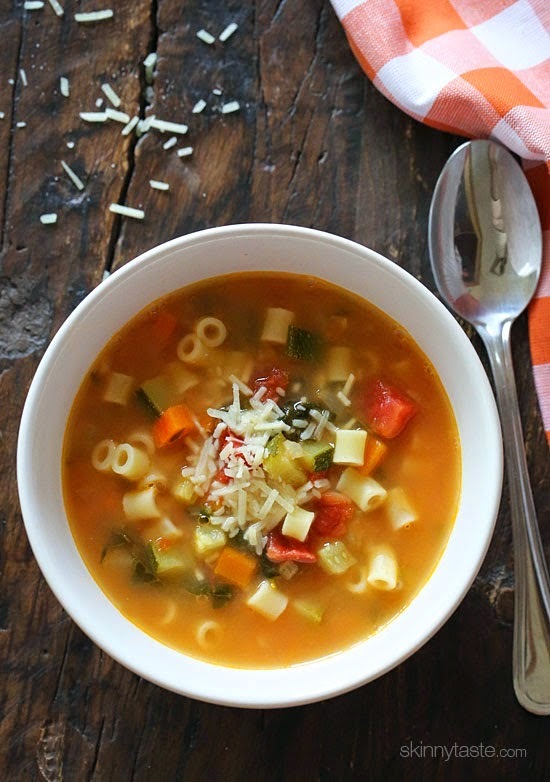 Get the complete recipe for Vegetarian Minestrone Soup from Skinnytaste. Visit the Soup or Stew Recipes to see all the slow cooker or pressure cooker soup recipes that have been featured on this site. Hi Eleanor, it does say that in the instructions on Skinnytaste, so that's my mistake in copying the ingredients for here. Will fix it, thanks for catching.